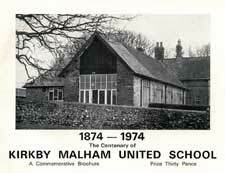 Over 100 years ago, before Kirkby Malham school was built, there appears to have been three schools in existence serving the villages of Malham and Kirkby Malham. The oldest one was in Kirkby Malham, founded in the year 1606 by Benjamin Lambert of Airton Hall and his friend John Topham. It was maintained by the income from certain lands. The school itself was pulled down about 100 years ago. Another school in Malham situated at the north east corner of the village and still standing was founded in 1717 by Rowland Brayshaw, also endowed with an income from lands. There is evidence of another school in Malham for girls, financed by a resident in Malham, who put £1,000 in Trust, the income from it being for the maintenance of the school but this school closed in the latter half of the 19th Century. Shortly after 1870 the late Walter Morrison, M.P., then only about 35 years of age, who was a governor of the Kirkby Malham school, expressed to the Endowed School Commissioners his willingness to grant or secure a suitable site and at his sole expense erect there on school buildings sufficient and adequate for accommodating the pupils of both schools thereby amalgamating both schemes and endowments. The commissioners gave approval to this proposal on the 9th August 1872 and a new scheme was prepared to continue education in one school for the two villages. 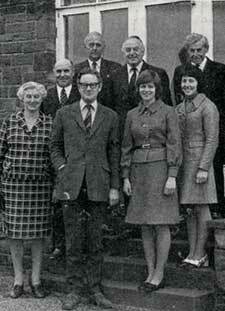 The first board of governors was formed during that year. After considerable discussion regarding a site for the new school buildings the present one situated mid-way between the two villages was decided upon, being part of Raw Riggs meadow which was an endowment of the Malham school. In order to comply with the conditions of the scheme, Mr. Morrison bought one acre of the meadow for the sum of £50, and the erection of the school buildings and headmasters house during the following two years cost him a further £2,874 3s.1 0d. The population of the whole parish at this time according to the 1871 census was 930, of whom about 700 lived within two miles of the new school. During the summer of 1874 when the new school was almost completed, the governors advertised for a headmaster and assistant teacher to take up duties when the school opened on the 10th August of that year. 58 applicants replied to the advertisement. Mr. Edwin Wheadon Hicks was appointed the first headmaster at a salary of £70 per year plus half the school fees and half the Government grant. His wife, Mrs. Elizabeth Hicks, was appointed assistant teacher and received £30 per year plus a quarter of the school fees and a quarter of the Government grant. They taught in the school for five years. 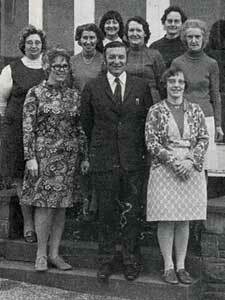 The fees for school children in the upper department were £2 per year and the infants approximately 10/-. The headmaster was allowed to take up to six boarders in the school house, each boarder to pay £25 per year. The masters house servant cleaned the school for £3 per year. According to the register of admission, about 70 children were admitted during the first term when the school opened. This was when the school building was smaller than at present. The scholars were of course drawn from a large area, northwards from as far away as Rainscar Farm, and from Calton, Newfield Grange and Otterburn in the south. It is surprising how many of those children whose names appear on the register in that first term have descendents still living in this area to-day. It must also be remembered that many of those 70 children attending were only "half-timers" as attendance at school was not compulsory, there being no law to enforce it, and this being an agricultural area, seasons like haytime and lambing seasons reduced attendance considerably as farmers kept their sons at home to help. Other children in the upper department worked half-time at the Scalegill silk mill or Airton mill and attended half days at school. It was not uncommon for scholars to leave school at 10 or 11 years of age to work full-time at these mills. During the first year 1874 a boy called William Carr, 12 years old, was admitted from Malham, but could only attend two hours each day from 9 a.m. to 11 a.m. after which he had to deliver letters round Malham Moor. On Wednesday, 14th October 1874, 34 scholars asked leave for the following day which was Malham Sheep Fair, so few scholars did in fact attend next morning that the school was closed for the day. Some days later a number of the older boys were questioned about their stained hands which it appeared impossible to clean. This had been caused by them assisting farmers with the "salving of sheep" a practice now replaced by sheep dipping in a bath. The meeting of the hounds on Malham Green when the hunts were taking place was another occasion when the school was almost empty. The first heating system in the school was one of coal fires and stoves, and evidently left much to be desired. Smoke from these appliances was no small problem, and very often when school opened in the morning the temperature was only 30°F rising to 40°F in the afternoon, which necessitated children doing lessons with overcoats on in order to keep warm. Scholars were often in charge of stoking the fires. This proved very unsatisfactory when the girls were in charge. They frequently went out. This brought angry letters from parents, the problem eventually being brought to the notice of the Governors who decided to pay 4d per week to certain boys to carry out these duties. Lighting too was rather poor; the original windows in the school were small and very high causing natural light to be scarce and only oil lamps provided artificial light. Many entries in the log book state that it was too dark to read or for girls to do sewing. In November 1886 a Mr. Carr of Park House, Bordley Moor, wrote to the headmaster requesting that his children could leave school at 3-30 p.m. instead of 4 p.m. in order that they could walk the four miles home before dark. Conditions generally were difficult in mid winter and many children from outlying farms and houses ceased to attend during these worst months. French and Latin were taught in those early days, extra fees being payable for these subjects. Mr. Walter Morrison called in frequently to hear the senior scholars read in French-on one occasion he had a French visitor with him and the entry states that he was well pleased with their knowledge and pronunciation. Police constable Redfern of Kirkby Malham called at school one afternoon to say that a mad dog had gone by up towards Malham and asked the master to keep the children indoors until he called again. It was late in the evening before the children were allowed to go home-after the dog had been shot, but not before it had mauled and bitten 7 other dogs. Rev. T. C. Henley was the vicar at Kirkby Malham Church when the school opened in 1874 and was on the board of Governors until he died in 1898. For practically all of those 24 years he acted as correspondent to the governors and took a very keen interest in all the work and activities of the school. After his death his wife made arrangements for a prize book-known as the "Henley" prize-to be presented every alternate year to the scholar gaining most marks for attendance and attainment. To those scholars who were much less ambitious, and were more mischievously inclined the cane appears to have been their just reward. The theory to "Spare the rod and spoilt the child" was very much in evidence in those days in establishing discipline. Some rather unusual offences appear in the log book-a child of 8 chewing twist in school-heating red hot pokers in the stove to chase other children-stealing from dinner bags-kissing the girls often cost the boys two cuts in each hand, but it failed to stop the practice. The Education Act of 1902 caused some concern to the school governors as it appeared they were to lose some control of the school and its endowments if the Act became law. The chairman, Mr. Walter Morrison, fought hard against the Authority of the Act insofar as it applied to Kirkby Malham school. Expert legal advice was sought and considerable correspondence with the Board of Education ensued. Eventually on 2nd December 1904 a Public Enquiry was held in the Church Hall, Kirkby Malham, heard by a barrister from London, Mr. C. B. M. Coore. The outcome was that after further consultation and discussion between the governors and Board of Education a new scheme of Management was drawn up which was satisfactory to both parties, this scheme being still in use to-day. A considerable improvement was added to the school facilities when spring water from Malham was piped to the school in 1913. The cost of the scheme was £195 and the contractor was Mr. George W. Parker of Airton. It was not until 1925 that water toilets were installed replacing the pit type earth toilets provided when the school was built. On 18th December 1921, Mr. Walter Morrison died aged 85 years. 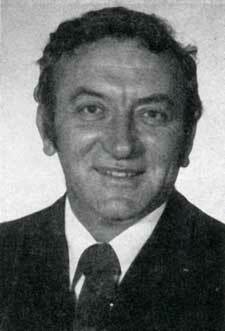 As already stated he had built this school and had been chairman of the governors for almost 50 years. Entries in the minute books refer to the stalwart work he had done in the interests of Education in the Dale and of his profound interest in all that concerned the welfare of the school. For almost 90 years the school continued in the original buildings erected 1872- 1874 but certain changes in the Education Act 1944 regarding minimum requirements of accommodation meant that the governors had to make plans for extending the school buildings. These were carried out in 1960-61 at a cost of just over £7,000 and consisted of a new dining hall, also used as additional teaching area, new staff room and toilets and a new kitchen equipped for cooking dinners on the premises. These had hitherto been brought to the school in containers from Hellifield. More ground was also taken from Raw Riggs meadow adjoining the school yard as a playing field. Yet again, due to increasing numbers of scholars, the centenary year sees the erection on the front green of a temporary classroom provided by the Education Authority, pending more permanent extensions being carried out by the Governors. The scheme also includes the provision of a turning area for the increasing number of cars which convey children to and from school each day, only half a mile in some cases, an example of the extent to which things have changed Since 100 years ago when children walked three or four miles regularly. And so the work goes on. Numbers are increasing; an excellent staff are in charge of all work and activities in the school; and the smooth running, progress and expansion is a credit to all who are involved in its management. As for the future-who knows? It is most likely that Mr. Walter Morrison would not recognise the present school as it was in his day-therefore it is more than likely that we should not recognise the present school one hundred years hence. Suffice to say, education must never stand still and Kirkby Malham school will be no exception to this concept.